Our Volunteers in Action...YOU ARE THE HEART OF OUR ORGANIZATION! Paddy Daratt and Mabel Dobbs accepting a $1500 check from Century Link at the Weiser Middle School assembly on May 23, 2018. Presenting the check to Angel Wings is Tristan Coria, the student who suggested that Angel Wings be given the donation. The funds were received from a grant that was written by Mrs. Kim Reece and her students as part of a philanthropy project they did. ​CI representing Angel Wings at the annual October health fair in Council, Idaho. Kids sold Lemon aid and donated proceeds $14, at Think Pink Block Party to Angel Wings Network. Laureen Pope, at Lutheran Pilgrimage Church, Ontario, OR. The ladies of the Emmanuel Lutheran Church in New Plymouth, Idaho. The ladies purchase fleece material, cut, tied and donated Ten (10) blankets to be gifted to cancer patients within our outreach areas. A lovely ministry from women of faith. CI Curtis out the door to deliver 31 Gifts chemo care bags to Angel Wings for distribution to cancer patients. 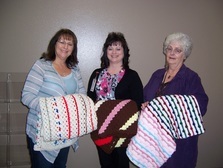 Linda and Paddy, present Hallie, (center) with crochet blankets to be given to patient in the infusion room at St. Alphonsus Cancer Center in Ontario, Oregon. ​The ladies of Xi Delta Omicron, chapter of Beta Sigma Phi, presented our coordinator Mabel with a donation of $500.00. Proceeds were raised from desert night at the Little Weiser Theatre event held each year. Xi Delta Omicron ladies have also volunteer at the Fall Survivor celebration in August 2013. We appreciate our friends at Xi Delta Omicron. 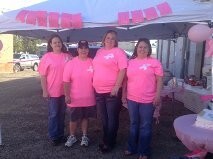 The ladies from the Copper Lounge during the "Think Pink" Block Party. MTE employees flipping burgers at block party. Suzanne Hart, Agent with (TIG) The Insurance Group is pictured with Linda Roundtree, ED, receiving Four (4) Prayer Blankets. 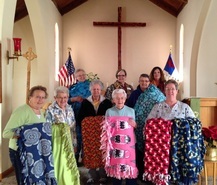 Suzanne purchased the material, cut, tied and donated the blankets to Angel Wings Network to be given to Cancer Patients.